These make a delicious starter or can be served with a sweet potato mash for a more substantial meal. Use a mild honey such as Waitrose Pure Honey - anything stronger will exert its flavour too much. Preheat the oven to 200°C, gas mark 6. Line a large roasting tin with a double layer of foil (this makes it much easier to clean) and place the ribs inside. Whisk the remaining ingredients together and spoon over the ribs. At this stage it may look as though there is not enough liquid, but the ribs will release fat as they cook. Cover the roasting tin with foil and bake in the oven for 30 minutes. Remove the covering foil and discard. 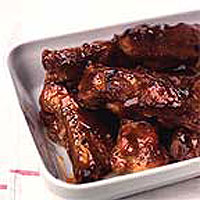 Turn the ribs, then return them to the oven for a further 30 minutes or until they are dark golden brown and sticky. Baste occasionally as they cook. If the ribs are not colouring, increase the oven to 220°C, gas mark 7, for the final 10 minutes of cooking time. Serve immediately, with plenty of kitchen paper to hand for wiping sticky fingers.